huevos estrellados, Ast güevos estallados, Eng. 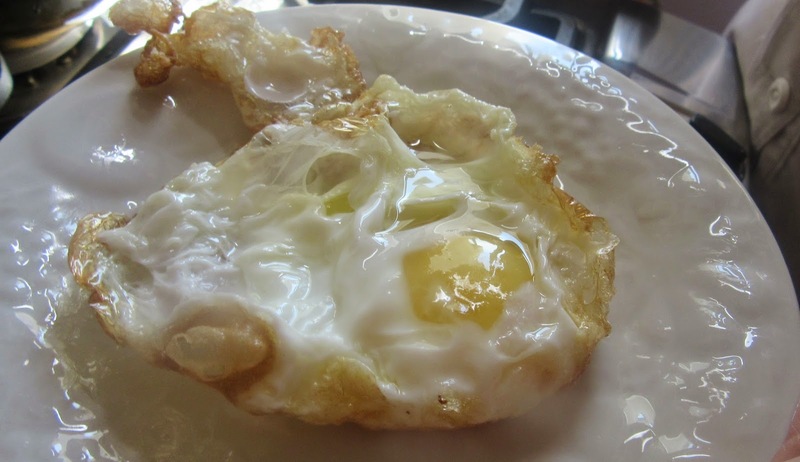 1. fried eggs; runny eggs sunny side up. 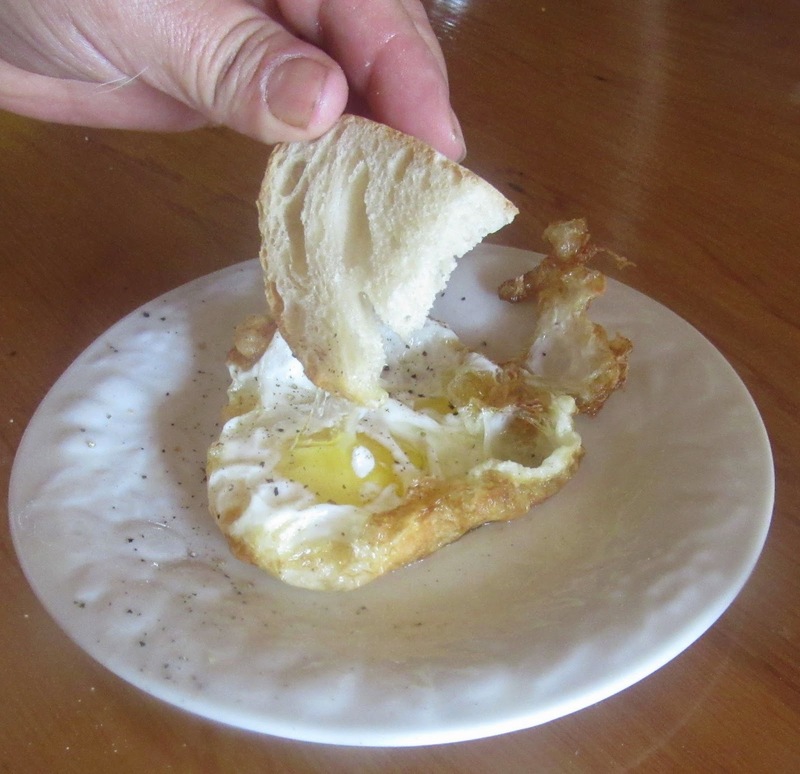 Customarily, in Spain, eggs are fried quickly in a large quantity of very hot olive oil making crispy whites curl up on the sides. The yolk is barely set. Bread is used to soak it up. In the Maragato Region of León and other northern areas, however, they are fried in a frying pan with three legs or set on a trivet with sizzling hot lard and served with bacon crisps or loin (marinaded or smoked) and homemade bread to sop up the yolk. The English fried them in lard also. There it was considered bad manners to push the egg around with one’s fingers. Knives were used for that. Then the yolks were sobbed up in the same manner as the Spaniards. 2. testicles. After the Spanish Civil War, during an extended period, food was scarce due to Spain’s isolation and World War II raging in the rest of Europe. Eggs were a luxury and affordable olive oil was green. GB Harrison in Night Train to Granada, recounts that a French man could not stand the repulsive sight of the fried eggs swimming in green oil when his boss’ wife served them for dinner one night. When the host understood, with he shouted to his wife in the kitchen, “Maria remove that man’s huevos!” Harrison goes on to insinuate that he, as a good egg, he ate his or perhaps he did so in trepidation thinking how María might remove his huevos. No Spanish Fried Egg can be eaten without it! Heat about 1/4 inch of olive oil in a very small, heavy skillet. Heat over medium-high heat until very hot; it should just be beginning to smoke. Crack an egg into a cup or mug. 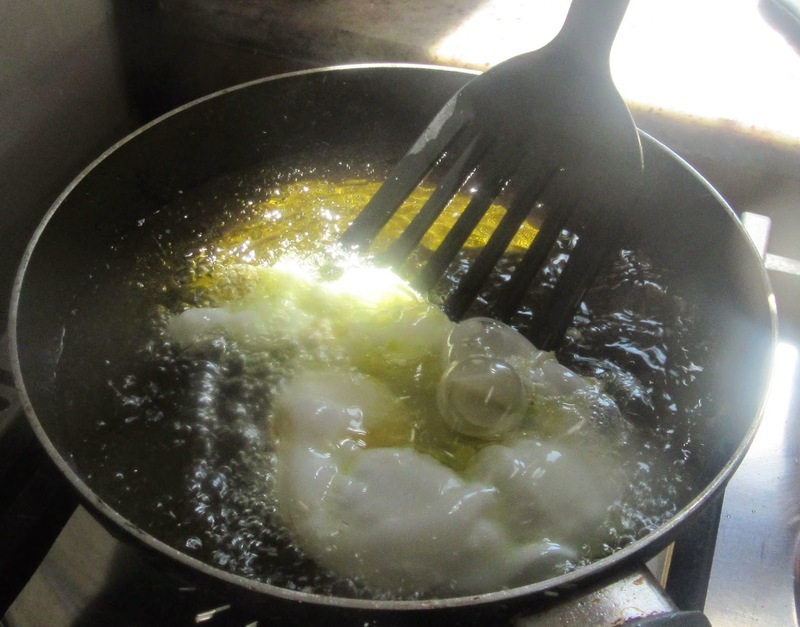 When the oil is hot enough, carefully slip the egg into the oil and immediately turn the heat down to medium-low. Spoon the hot oil over the egg as it cooks. Cook for no more than a minute and a half then take the pan off the heat and remove the egg with a slotted spoon. Sprinkle with sea salt and fresh pepper and enjoy immediately!